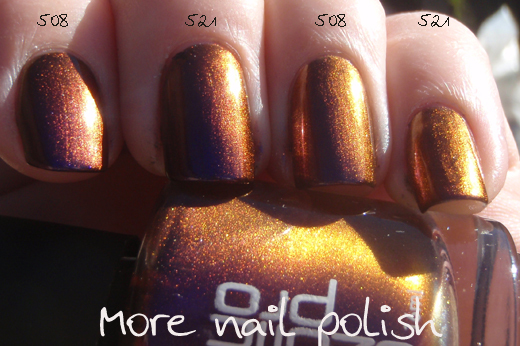 I had a request to do a comparison swatch between Artform/Ozotic 508 and Ozotic 521. 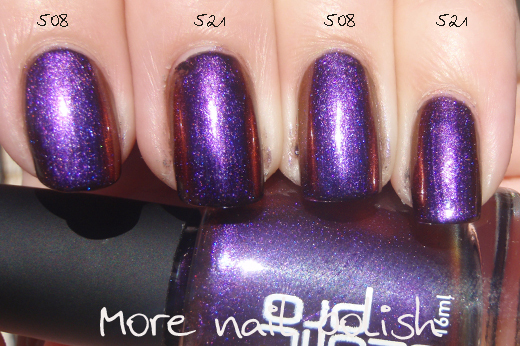 These swatches are two coats over black and show 508 on the index and ring and 521 on middle and pinky. As you can see, both have a purple base colour. Here it is outdoors (with the sun behind my fat head - as you can see in the reflection). Here in the direct sun. Both polishes shift through shades of pinks, reds and maroons. And finally shift to a burnt orange gold. To my eye, I couldn't tell any difference. So I have no idea why they would re-release this is a seperate number. 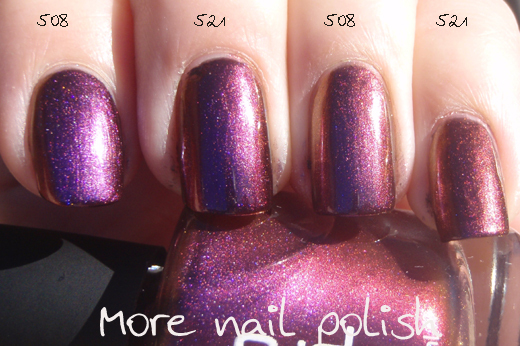 I notice that in the B-range of polishes (believed to be another private label from lymineye) that they have both shades (508 & 521) listed for sale. If you have one, you probably don't need the other. Jia, I hope this was helpful. I certainly found it interesting. they certainly are both gorgeous! Thank you so much for the comparison Kitties :) This certainly helps. I'm now very pleased I've 521 as they look dupe for me as well. Your nails and your photos are as beautiful as usual. Haha.